One wintry day long ago, during one of our trips to Tehran, I remember accompanying my mother as she went all over town running errands and shopping. It was getting late and we were hurrying to get home before dark when my mother stopped at a دکه ی لبو فروشی - dakeh-ye laboo forooshi (street vendor stand selling beets). A bunch of large, glazed purple/red beets were stacked neatly with some floating in their juice on a large tray. How do they make such simple and inexpensive street food so delicious? 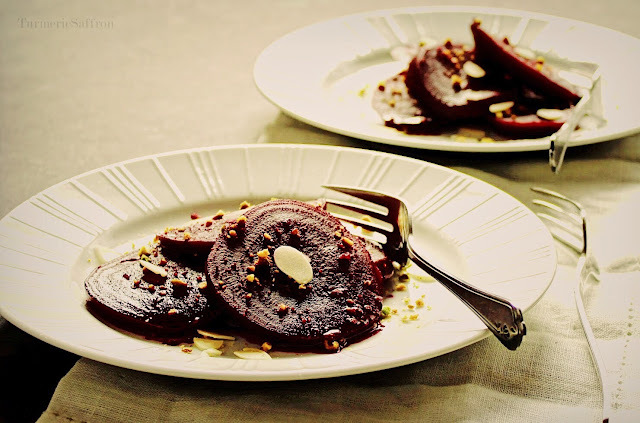 There must be an ancient secret recipe among the beet vendors in Iran - one that I would really love to get my hands on. Biting into a perfectly sweet, tender and warm laboo in the snow after a seemingly endless day was especially gratifying. لبو/ چغندرپخته Choghondar pokhteh/Laboo (cooked beets) happens to be one of Iran's popular street foods throughout the winter months. 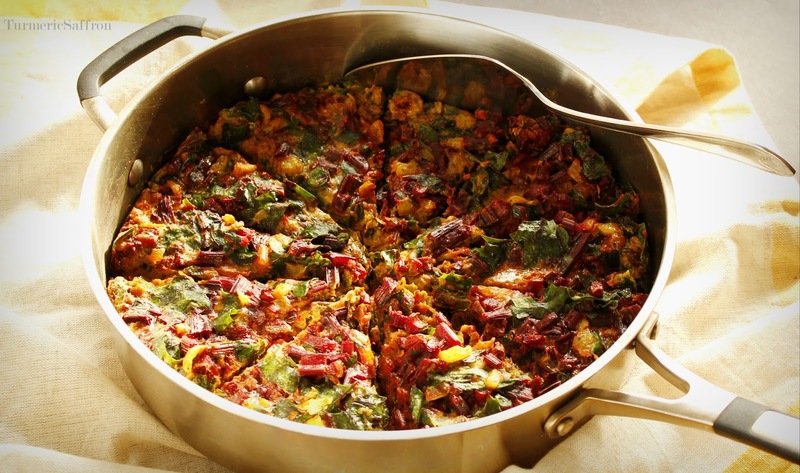 And this recipe brings back the cherished memories of my youth back home in Iran. 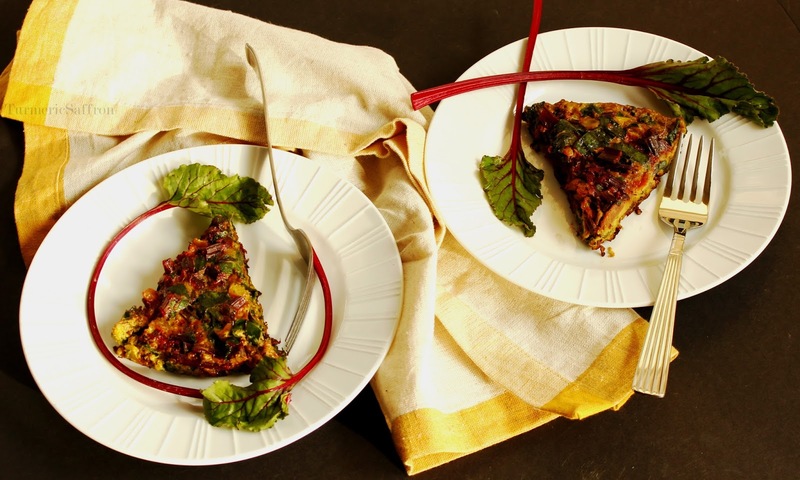 چغندر - Choghondar (beet) is highly nutritious, low in calories, quite versatile and has a gorgeous color. 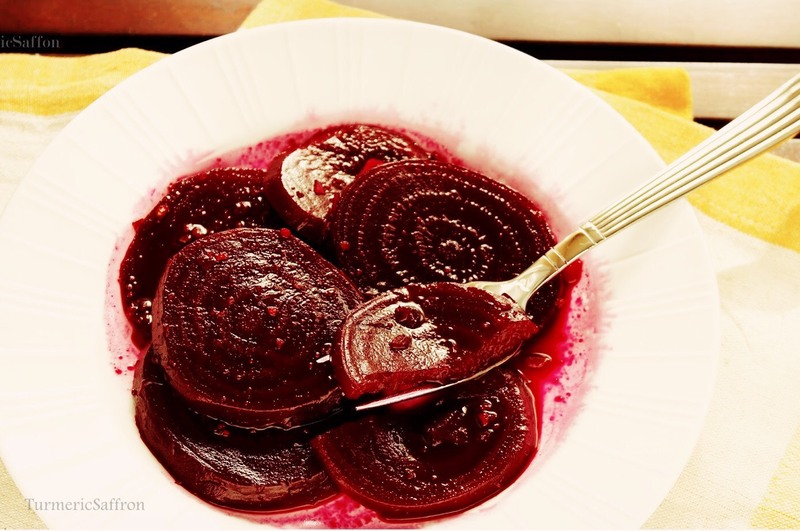 Beets can be thinly sliced or grated raw into salads, steamed, boiled or baked. 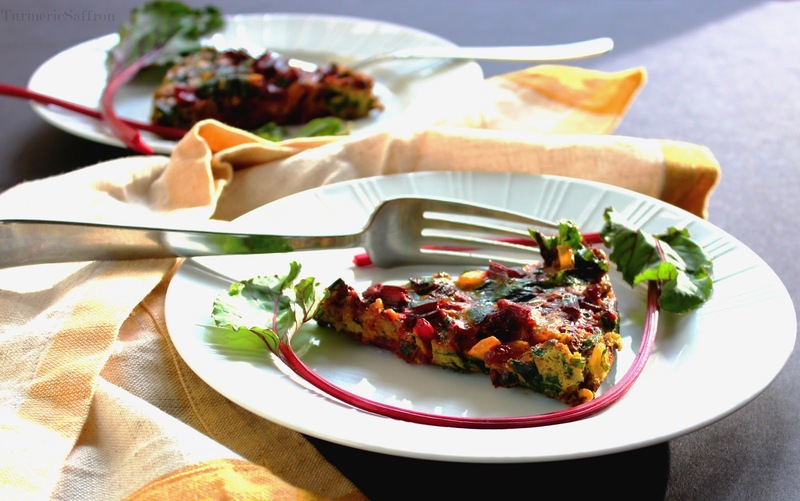 Beets can also be used in both sweet and savory dishes. Those who love the earthy taste of beets can enjoy them throughout the year since they're always available in the market. I have tried various ways of preparing beets. The simplest one is to roast them until tender and just serve them plain. Beets have a very high sugar content and there's really no need to add any sugar/sweeteners. However, I am on a quest to achieve the delicious and flavorful taste of the laboo I had in Iran. I like to add honey for sweetness to the dish. You can use table sugar, brown sugar, or honey, whichever you prefer and you can adjust the sweetness to your liking. 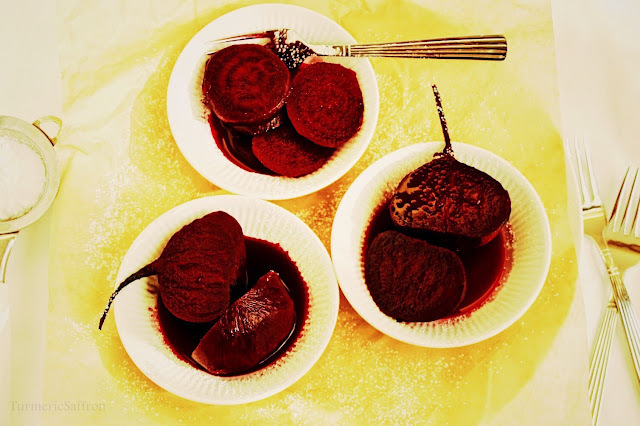 In addition, adding a good squeeze of lemon juice will enhance the color as well as the flavor of beets. For this recipe I peeled and sliced them before cooking. You can cook beets whole instead of slicing them. Just remember that beets stain everything and you may want to wear gloves while peeling and slicing them. 2 teaspoons white sugar or brown sugar or honey (I used raw unfiltered honey), use more if you like. Place the beets in a large heavy saucepan. Add enough water to cover the slices by 2 inches, bring to a boil for 2-3 minutes over medium-high heat. Reduce the heat to medium-low, cover and cook for about 30 minutes. Add the lemon juice and honey, cover and simmer over low heat for another 10-15 minutes or until beets are tender and glazed. Make sure there is some liquid left in the bottom of the pan. To serve place the beets in a deep serving platter, pour 2-3 tablespoons of the remaining liquid over them. Sprinkle with almonds and pistachios and serve immediately as a side dish or snack. Beetroot greens (leaves and stems) also have nutritional value and can be substituted into most recipes that call for spinach. 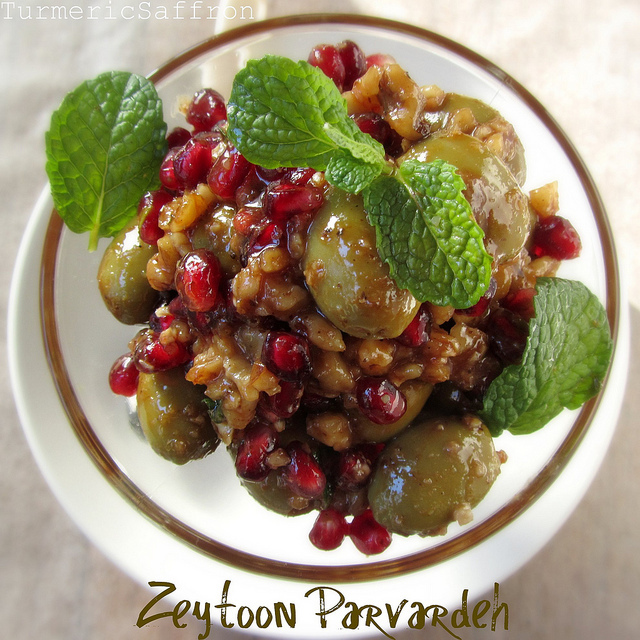 It can be added to ash reshteh, kookoo sabzi or even ghormeh sabzi for a great flavor variation. After I cooked the beets I decided it was about time to make a dish just using its greens, the under-appreciated and often discarded barg-e choghondar, and that's how this beautiful and delicious کوکوبرگ چغندر kookoo barg-e choghondar was created. In a medium frying pan heat 2-3 tablespoons of oil, add onions and saute over medium-high heat until light golden brown. Add turmeric powder and garlic, saute for another 2-3 minutes. Using a slotted spoon, remove fried garlic and onion from oil, set aside. In a large bowl whisk the eggs until well mixed. Add the green beet leaves, red stems, fried onion and garlic, flour, salt, pepper, cumin, and cayenne. Mix thoroughly. In a large skillet heat 3 tablespoons of oil over medium-high heat, gently pour in the mixture. Reduce the heat to medium-low, cover and cook for 35-40 minutes. There's no need to turn them over. This way they'll maintain their gorgeous color and fresh rustic look. Serve warm or room temperature with warm bread, salad, mast o khiar and torshi. As I am sure many of you may already know, since I have already shared the news on my Facebook and Instagram page, I was recently chosen by Yahoo Food as their blogger of the week. The following three recipes: Zucchini and Yogurt Salad, Fesenjoon and Khoresh-e Karafs were featured during the week along with a Q&A. I am truly honored and delighted.